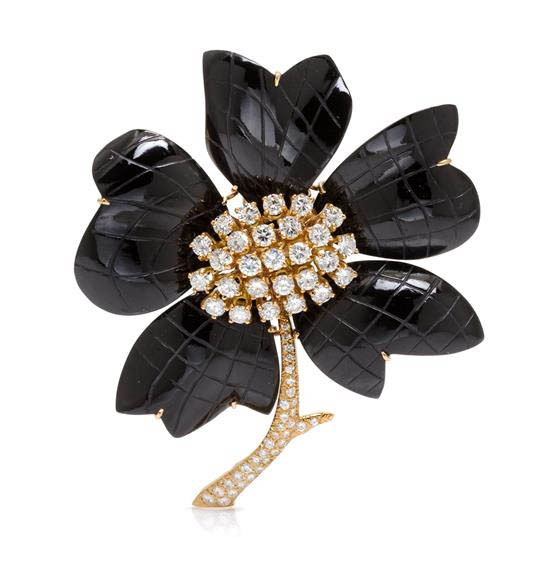 A Van Cleef & Arpels brooch of onyx and diamonds in 18K yellow gold. Let the weeping begin! 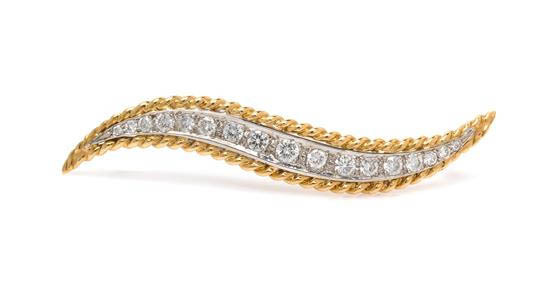 If you would like to get your September off to one dreamy and glamorous start, do head over to Leslie Hindman Auctioneers to peruse the many glorious offerings about to hit the block in Chicago on September 16, 2015 at 5:30pm Central Time as part of the “Important Jewelry From the Estate of Rita Dee Hassenfeld” auction. I learned from the Leslie Hindman Auctioneers catalogue that Rita Dee Hassenfeld was born in New York City and graduated from Adelphi University at the age of 19. She was a ballerina and accepted into the School of American Ballet but decided instead to get married and focus on having a family. She wed Harold Irwin Hassenfeld, whose family business was Hassenfeld Brothers, which you may know better as Hasbro Industries, manufacturer of Monopoly, Play-Doh, and Mr. Potato Head! She and her husband raised their three childen in Nashville and Palm Beach and were noted for their generous philanthropic efforts. Ms. Hassenfeld passed away in January of this year at the age of 88. Mrs. Hassenfeld had amazing taste in jewelry and quite the collection, the online catalogue is filled with so many things to love! Here are a few pieces that I fell for at first sight and there are many, many more over at the auction catalogue. I regret that I did not know of this auction sooner because there was a preview open to the public at the Waldorf-Astoria that I would have attended! For those of you in Chicago, click here to see the exhibition times that run for a week, from September 10-17, 2015. Enjoy your Labor Day weekend and these stunning pieces of jewelry! 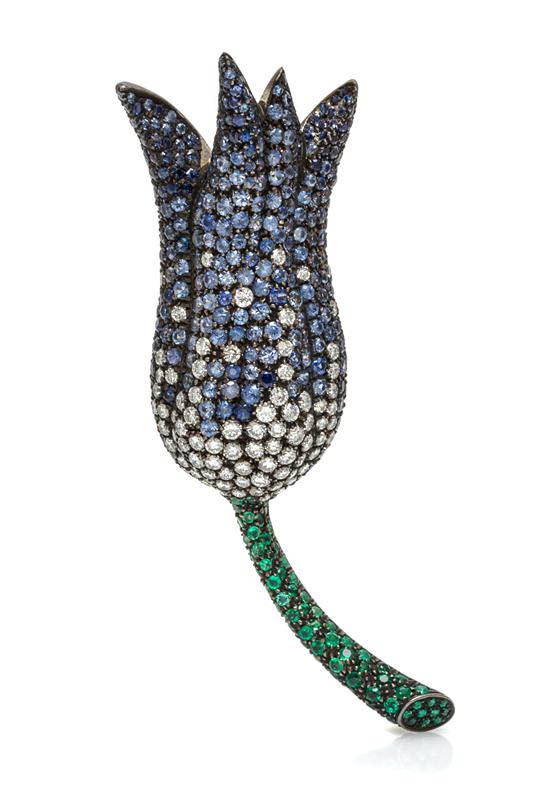 A tulip brooch of diamonds, sapphires, and tsavorite garnets in 18K gold. This tulip brooch is my idea of a perfect pin since I am crazy for multicolored pavé pieces. I would love to see how this beauty sparkles in the light, wouldn’t you? A gorgeous abstract multi-gem brooch. This striking brooch is mesmerizing for its use of cabochon-cut amethyst, pink tourmaline, chalcedony, and dyed blue chalcedony, surrounded by inlays of black onyx and diamonds in 18K yellow gold. I bet this brooch is one you cannot take your eyes off of in person! 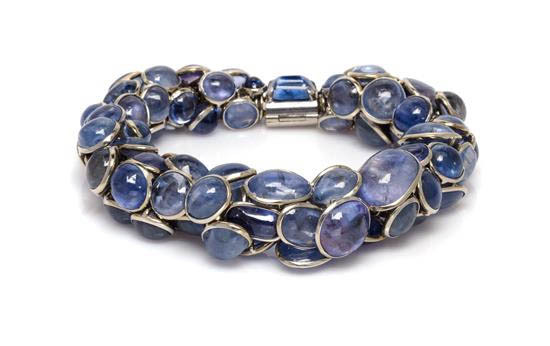 A Seaman Scheppes bracelet of cabochon sapphires in 18K white gold. Don’t mind that sound of crying you might be hearing right about now, that’s just me dying over this vintage Seaman Scheppes bracelet of the most amazing set of cabochon sapphires. I hope this goes to a good home, especially if that home has someone with a September birthday. How about this as a celebration of your birthstone? This is the kind of piece I wish we could see on the red carpet during the next Golden Globes or Oscars. Would love to see this on the red carpet! 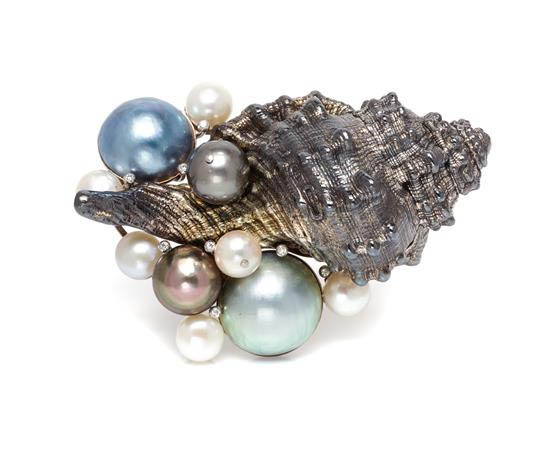 An enchanting seashell brooch by Lee Havens of pearls and diamonds in 18K white gold. This beauty by Lee Havens seems like the perfect summertime brooch. I adore not only the colors but also its mix of Mabe, Tahitian, and button pearls affixed to the seashell. I would want to wear this pretty regularly from June until August! 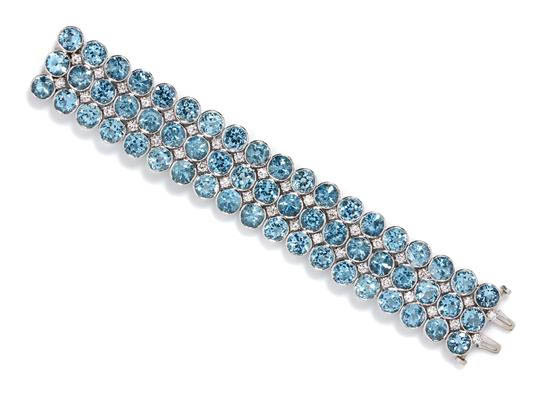 An aquamarine and diamond three-row bracelet set in platinum. My blue heaven! I have a particular fondness for aquamarine stones so this magnificent aquamarine and diamond bracelet set in platinum stopped me in my tracks with one glance. I love the bezel settings for the aquamarines and that there are rows of diamonds in between! The following two brooches are from the “Important Jewelry” auction to be held September 17, 2015 at 12pm Central Time and features pieces from a number of different consignors. 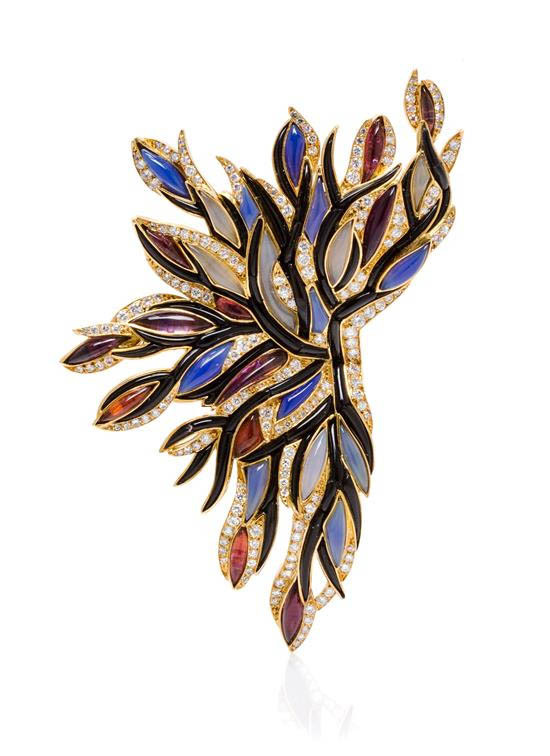 A 1960 Van Cleef & Arpels brooch. I love the quiet elegance of this 1960 brooch by Van Cleef & Arpels featuring 17 round brilliant-cut diamonds in white gold, outlined in yellow gold. There is something about this wave shape that always makes me think of the early 1960s and I never fail to be completely charmed by it! This seems to be the kind of brooch that would look amazing whether you wore it on a piece of clothing or in your hair! Love this Van Cleef & Arpels dog brooch! 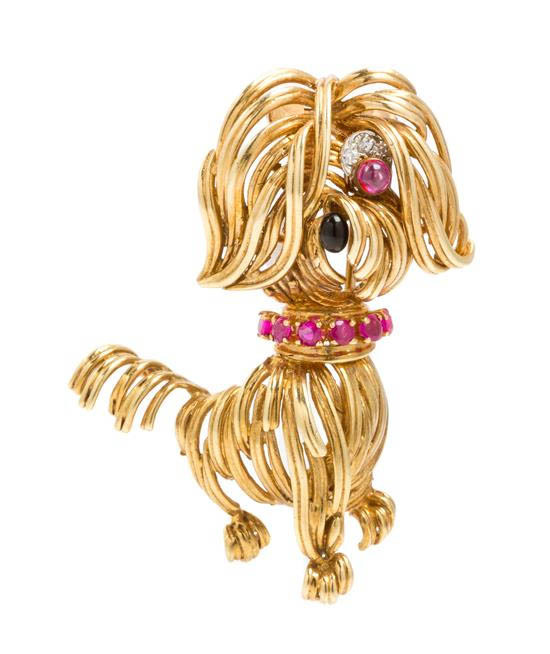 I love this vintage Van Cleef & Arpels pooch so much! I believe it is from the 1960s or early 70s and part of the “La Boutique” series of playful animal clips that Van Cleef & Arpels offered to attract a broader range of clients back in the day. Isn’t this adorable? I don’t even own a dog and I would still love to pin this to my fall coat! Let me know if you have any favorites in this roundup. If you end up bidding on something at this auction, whether in person or online, come back and tell me everything! All photos courtesy of Leslie Hindman Auctioneers. I am so taken with the multi-gem one...all are stunning! Have a wonderful Labor Day, Jill! The Seaman Scheppes bracelet is as the say in Brooklyn "to die for". It can be worn with jeans & a nice white tee, to a cocktail party or a formal event. Just fabulous! Absolutely stunning pieces! The Seaman Scheppes bracelet is gorgeous, and the seashell by Lee Havens is uniquely beautiful. I would love to see these in person. WOW he must have been a GREAT GUY to turn down ABT! I loved my MISTER POTATO HEAD! Funny thing thats brings people money..............I wonder who and how the ideas came to some one's mind! Lovely collection..........hope they all find a GOOD NEW HOME where the JEWELS will RADIATE! Hi, Jill. Not in Chicago -- I live in Canada. I shall live vicariously through your post! THANK YOU - for the lovely post!! I am so in love with the jewelry you keep telling us about lately <3 The Cabochon bracelet is my favorite here. I think I will go online and check out the auction, just to get a feel for the prices. I am very curious as to what these pieces will sell for in the end. By the way, I have the Elizabeth Taylor book you have on your side bar. And it describes the story of the Wallis Windsor Brooch - fascinating, don't you think? I must have missed this post due to the Labor Day weekend Darling Jill!